Park Life Gallery is proud to present..
Chris Russell’s paintings explore his perception of and connection with the natural world and his interests in a spirituality that is connected to the cycles of nature, an infinitely complex yet entirely tangible world. He examines alternative outdoor lifestyles that appropriate ideas from indigenous cultures and infuse them with an emerging consciousness of ecology. While struggling to embrace a tradition of nature-based spirituality, he recognizes the incongruity of his generation appropriating native beliefs. 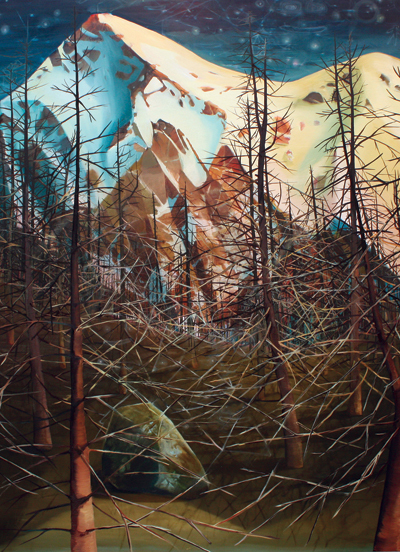 Through images of wilderness his work tries to communicate a reverence for nature, one tempered by notions of disconnection and disillusionment. Working within the old genre of landscape painting he suggests that our human connection to nature is increasingly important in the contemporary world. The landscapes created are not as much about reproducing places as they are about the process of creating a painting that ultimately reveals something new. Christopher was born in Boulder Colorado in 1983. He studied painting at California College of the Arts where he received a Bachelor of Fine Arts with “High Distinction” in painting and drawing from CCA in the spring of 2006. He currently lives and works in the East Bay as part of the artists’ collective Paper Mill Studios.